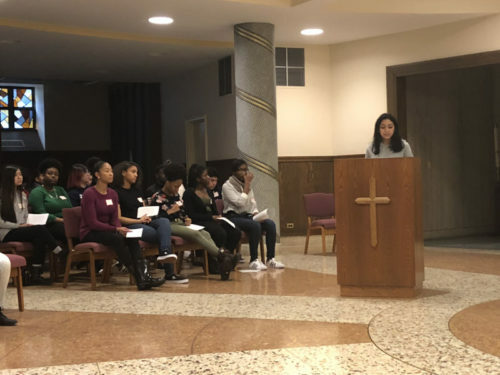 More than 50 student leaders representing nine different high schools participated in Catholic Leadership Day at Immaculate Conception Center, Douglaston, March 2, to continue formulating their leadership skills. 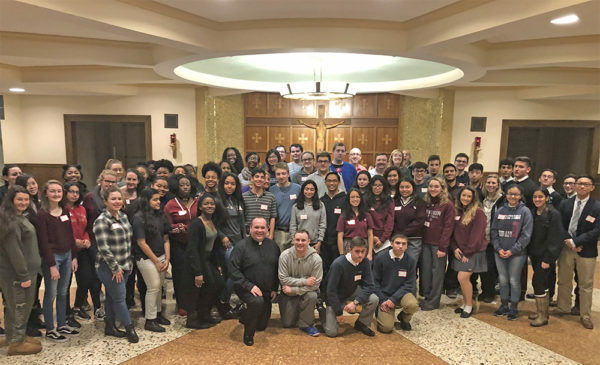 Faculty members accompanied students were from Cathedral Prep and Seminary, Elmhurst; Archbishop Molloy, Briarwood; The Mary Louis Academy, Jamaica Estates; St. Francis Prep, Fresh Meadows; St. Saviour, Park Slope; Bishop Loughlin, Fort Greene; Xaverian, Bay Ridge; Bishop Kearney, Bensonhurst; and St. Edmund Prep. Cathedral Preparatory and Seminary students and faculty enjoy lunch as a small group. 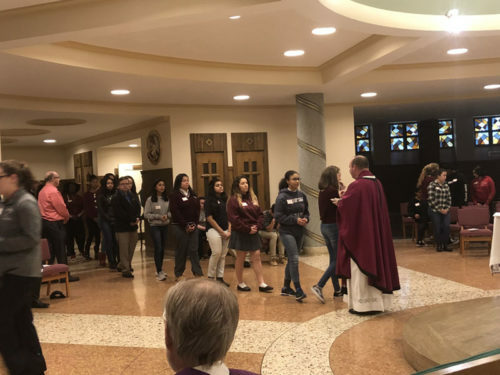 Student leaders received Communion during Catholic High School Leadership Day. 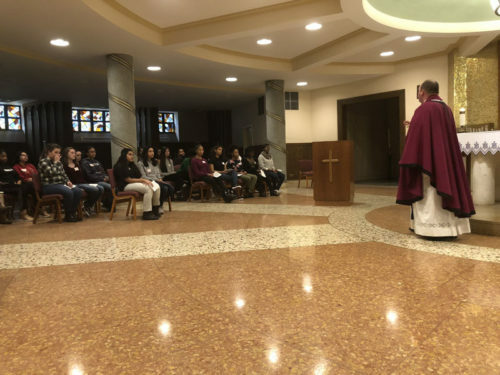 Father Sean Suckiel, diocesan director of vocations, encouraged students to foster a relationship with God during their journey as student leaders. The Mary Louis Academy students draw their saint pictures. 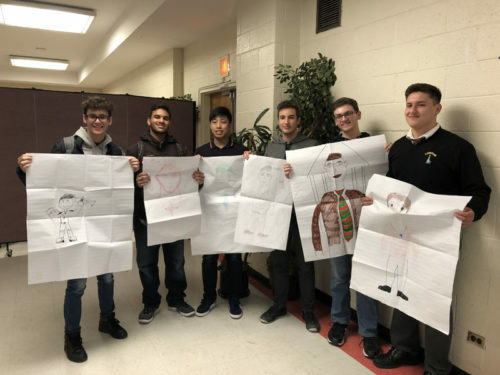 Xaverian students showcase their saint photos that described their journey to sainthood. St. Saviour students ended their day with smiles. Fr. 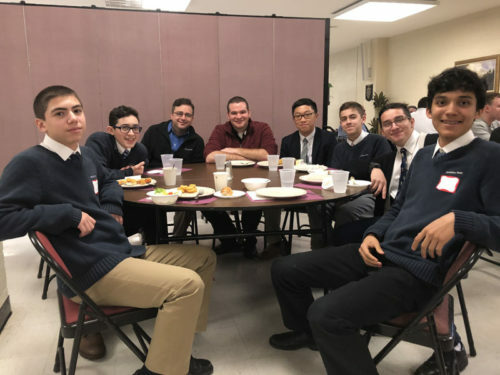 Michael Gribbon, chaplain at St. Edmund Prep enjoys fellowship with students. Kearney H.S. 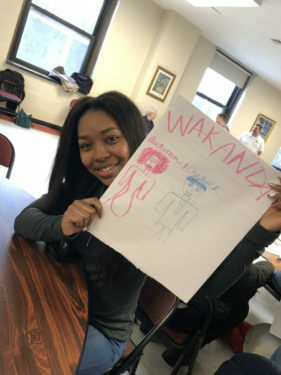 student shows off her dream to be the queen of Wakanda, a fictional city based off the movie "Black Panther". Cathedral Preparatory and Seminary students race to finish their saint photos. 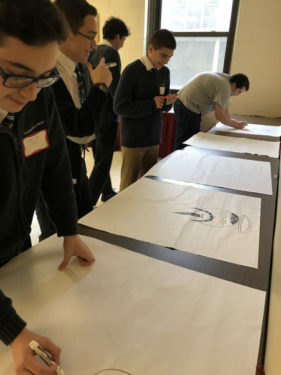 The student leaders took part in workshops that allowed them to creatively express their faith. 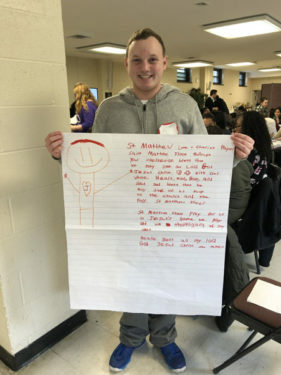 Through group activities led by St. John’s University campus minister Dr. James Walters, students had a chance to write down their short and long term goals, draw themselves as future saints, and present their ideas to the entire group. 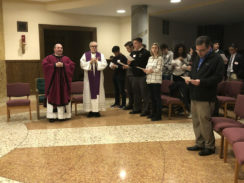 After the first group workshops, Mass was celebrated in the Bishops’ Chapel by Father Sean Suckiel, diocesan director of vocations and chaplain at Xaverian. Father Gribbon concelebrated and Deacon Basil Bliss from Bishop Loughlin assisted. Father Sean Suckiel was the main celebrant at the Mass for Catholic Leadership Day. Father Michael Gribbon concelebrated and Deacon Basil Bliss assisted. 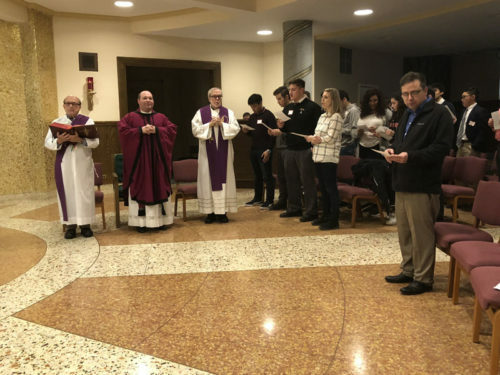 In his homily, Father Suckiel encouraged the students to maintain their relationship with God throughout their journey as young student leaders. The idea for the day came from students reacting to Pope Francis’ letter to young people regarding the upcoming Synod of Bishops on “Young People, the Faith and Vocational Discernment.” The Holy Father asked young people not to be afraid to listen to the Spirit who proposed bold choices and not to delay taking risks that allows their voices to be heard. leadership training day for their students. 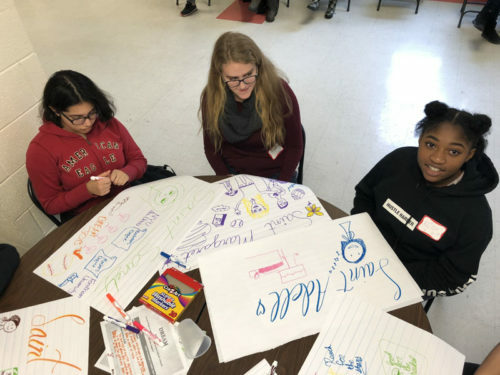 I quickly began planning this program,” said Paul Morisi, diocesan youth and young adult faith formation director. Young women spoke about how they want to embrace corporal works of mercy to serve others throughout the world. 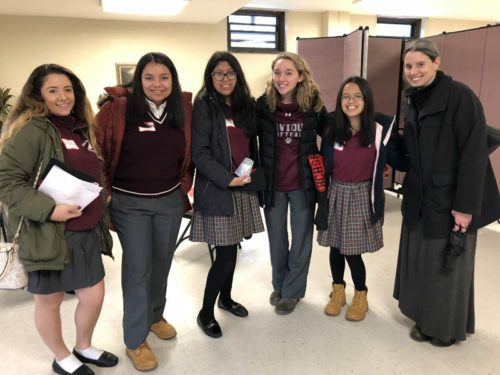 Bishop Loughlin junior Halle Primus said her Catholic foundation has influenced her and will continue to impact her in the future. She chose the Confirmation name of Elizabeth, Mary’s cousin, because it relates to her goal to become a doctor and help women and children. 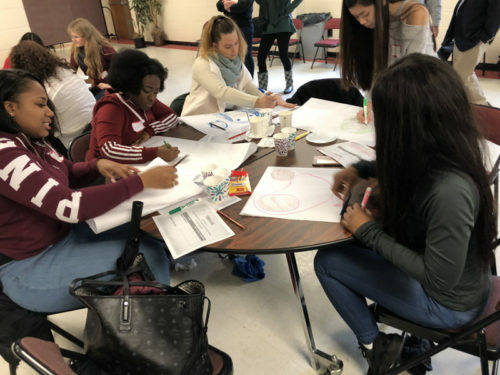 “If you are a leader and you’re a Catholic leader especially, you shouldn’t be afraid to express your thoughts and your feelings and your ideas because you’re doing the right thing,” said Primus, who attended Mary Queen of Heaven Catholic Academy, Mill Basin. For Xaverian junior Louis Savoia, his passion sparks from international relations. During a group presentation, he stood in front of the whole room and spoke with fervor and grit. His classmate Joseph Wisidagama also shared his same desire for change that does not tolerate injustice or the globalization of indifference.